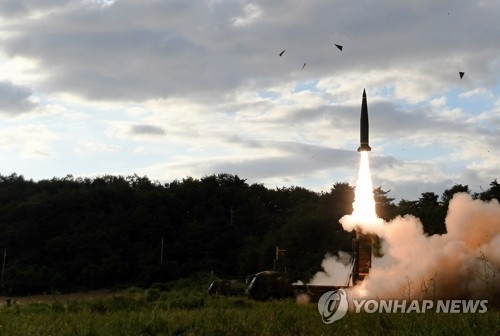 SEOUL, Sept. 15 (Yonhap) -- South Korea's military said Friday it has fired two ballistic missiles in a swift response to North Korea's latest provocation. The Army shoot the Hyunmoo-2 missiles from an eastern site near the inter-Korean border just six minutes after the North's missile firing from Pyongyang. One "accurately hit" a simulated target in the East Sea about 250 kilometers away, a Joint Chiefs of Staff (JCS) official told reporters in a background briefing. It's the same distance between the training area and the Sunan airfield in Pyongyang, where the missile was fired. The other, however, fell into water "in the initial stage," he added. Related authorities are analyzing the reason. A defense ministry official pointed out the South's response came while the North's missile was still flying. He stressed that the military was able to take such a quick measure as it detected signs of the secretive North preparing to fire the missile in advance. Related information was immediately reported to President Moon Jae-in who ordered the missile training. The JCS, meanwhile, strongly denounced the North for its brinkmanship. It's a blatant violation of the U.N. Security Council resolution against the regime and a serious threat to the peace on the Korean Peninsula and in the world. The North will be fully held accountable for all consequences from its provocative acts, the JCS warned in a statement.